What is the most effective way for an importer or distributor to present a portfolio of wines to the press? Or perhaps the better question would be, what are the pros and cons of the many different ways to show wine writers your new releases? • Hold a portfolio tasting (with winemakers present) at a nice restaurant? • Take part in a trade tasting? 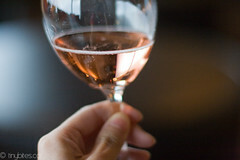 • Take part in a special event such as World of Pinot, Taste Washington or IPNC? All of these venues have their place, but each of them has pitfalls to be avoided. Shipping samples is most effective if the reviewer is notified in advance, and good documentation (technical information, suggested pricing, names of distributors, release dates, etc.) is provided. Little things can make a big difference. Were the wines packaged in recyclable materials? Was shipping timed to avoid damaging them? Was there some sort of follow-up to make sure they were received and properly identified? Did the timing of the shipment (in terms of upcoming holiday columns, for example) allow for lengthy lead times (still a factor in the print world). Even when all this is done really well, the reality is that writers receive many, many samples, and few are chosen for actual review. But if you keep sending, a diligent writer will keep tasting, and it is reasonable to expect that eventually some press will result. If not, it’s fair to ask why not. Dinner at a fine restaurant with great wines and an entertaining winemaker or two can be among the most interesting experiences that a journalist can have. But as often as not the food, ambiance and socializing obscure the actual impact of the individual wines. How many wines will be poured? What is the quality of the stemware at the restaurant? Is it so noisy that conversation is difficult? Are there intrusive kitchen smells? Is the table so crowded with plates, glasses, wine bottles, etc. that writing notes becomes a juggling act? Do the appetizers and entrées help or hinder the appreciation of the wine? Granted, not everything can be controlled. But in my experience, the most effective portfolio tastings in restaurants are staged in a quiet room, out of the main dining area. Stemware is of the highest quality. Wines are served in a timely fashion, and if possible, both with and without food. There are enough people present to make it a lively social occasion, but not so many that the entire table cannot participate in a group conversation at least part of the time. Trade tastings work best for retail buyers. Reviewers cannot be expected to make thoughtful, detailed notes while sipping and spitting dozens of wines in crowded venues with many hundreds of people. The better option (done in Europe more than here in the US) is to have a smaller tasting room set aside for press, and do a more focused (and quiet) tasting with a theme – a varietal, an AVA, etc. Special events are great showcases. But the scale of the event must not be so large that your efforts are lost in a sea of wine. If your wines can be presented in the context of a seminar, a special tasting, or some other activity that draws press people specifically interested in the topic, you are far more likely to make a strong impression. The bottom line? The wines should always be the most important aspect of any presentation. The more you can control the ambiance, the noise, the smells, the stemware, the things that potentially distract from a focus on the wines, the better success you are likely to have. RE: "Was there some sort of follow-up to make sure they were received and properly identified?" I know some wine writers who feel that follow-up, as in making sure you received the samples, is intrusive and obnoxious. Some feel that follow-up gives the PR person and extra chance or two to sell you on the wine and solicit a pub date for the review. I do not share that feeling; PR folks have a job to do too. Dennis, I agree that PR folks have a job to do, and the good ones do it well. I do not like follow-up phone calls, and I make that very clear on my website and e-mail communications. However, a follow-up e-mail is perfectly OK, in order to make sure the wines arrived and they were in good condition. It is helpful to remember where they came from, who sent them and why, as I may not taste thru them right away. But as I said, no phone calls please!